Useful in chronic cases of laminitis or founder. Can be used for up to 3 months. Laminitis/founder is a systemic condition with disease or disharmony seen in the body and the symptoms of pain and heat seen in the hooves both in western veterinary medicine and Traditional Chinese veterinary medicine. As seen in the actions of the individual herbs the formula is useful to invigorate blood, resolve stagnation and clear heat treating the root and the branch. Traditional Formulas: Administer two (2) tablespoons twice daily for the initial twenty days. Then, administer two (2) tablespoons once a day thereafter. 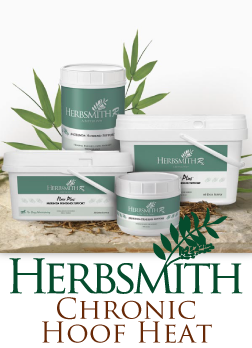 Note: In the event the horse refuses to eat herbs, start with small amounts in the grain until the horse is acquainted with the taste or try the Flax Plus version of this formula. Almost all horses will eat the herbs in their grain. Flax Plus: Administer one (1) scoop twice daily for the initial twenty days. Then, administer one (1) scoop daily thereafter. Six tablespoon scoop included. Precautions:Not to be used in pregnant mares. Discontinue use if diarrhea occurs.